Watching yourself in a video is always strange. I got interviewed a few months ago to provide a testimonial about the IDC CIO Summits, and talk about what I liked and got out of the most recent one. But seriously, I highly recommend the IDC CIO Summits. They allow you to spend a day (if you can spare it) immersed in the world of business technology leadership, see what others are doing well (or not so well), and talk to your peers about how they’re approaching some of the challenges you may be facing. 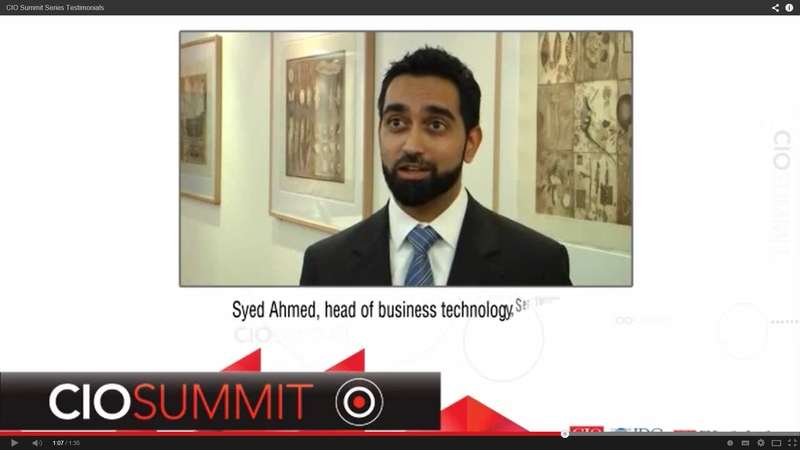 Looking forward to being at the Sydney CIO Summit 2014 on 24 July! On Monday, 16 June 2014 – two nights before 2014 State of Origin Game 2 – the AGSM hosted Australian Rugby League Commission CEO David Smith in the latest instalment of their Meet the CEO series. As usual, the Sydney Four Seasons Hotel was packed out, and the event certainly didn’t disappoint. After being introduced by ASB Dean Professor Geoffrey Garrett and NRL Commissioner and ASB Business Advisory Council member Cathy Harris, Mark Scott (Managing Director, Australian Broadcasting Corporation) got down to interviewing David. I have to admit that I was (pleasantly) surprised by David’s style. I’m a strong believer in using sporting teams rather than military teams as the basis to study business leadership, management and strategy. I went in thinking that David would use lots of sporting language in his interview. Instead, we were presented with an articulate, sophisticated banker who talked about managing an iconic Australian sporting organisation in an intensely competitive and challenging environment. At one point in the interview he explained that this was a business audience and the conversation was about the business of sport, so he felt it was the appropriate language to use. He talked a lot about market positioning, local and international growth strategies and leveraging brand equity. It was all very insightful, however I felt at a couple of points that his responses were more rehearsed and media-trained than spontaneous. Nevertheless, he was still very polished and impressive. I won’t summarise the interview, but here are some of my take-aways from his answers. No matter what sort of organisation, at some point it will need to be managed professionally if it is to be sustainable and grow. The NRL is a perfect example. Even with strong cultural and community roots and passionate (fanatical) supporters, when David took over it was in pretty bad shape for an organisation of its size and age. The NRL Commission and David have implemented rigorous business thinking and strategies, and the results are evident in both on-field and off-field performance of the League. At first, the choice of an investment banker to run a national sporting organisation seems strange. But as both Cathy and David pointed out, one of the reasons he’s able to do well is the ability to apply transferable skills that he brings from his previous roles. David mentioned that this was his fourth “career”, including an engineering background, military service and banking. In addition to the ability to abstract problems and apply skills learned in seeming unrelated fields, I also think that introducing someone from outside an industry vertical provides an opportunity to approach issues from a fresh perspective. In my own career, I’ve found that this has helped me challenge embedded assumptions and re-frame conversations. When asked how he is able to relate to the everyday person and the NRL fans, David talked about staying connected to his origins. He talked about coming from a mining town with modest means, and not forgetting that. This reminded me a bit of Cameron Clyne, the CEO and Managing Director of the National Australia Bank. In his Meet the CEO interview, he talked about growing up in a mining family and using the strong work ethic instilled in him to stay grounded. The other advice he gave was to speak in a language that was appropriate to your audience. The obvious example was his use of sophisticated business terminology suited to the audience at the event. However, he said that when talking to the clubs and their members, he uses terms and ideas that make sense to them. Seems a bit obvious, but a good reminder nevertheless. This is especially important for technology professionals, who need to get better in speaking in terms of business problems and solutions rather than IT implementations. CIO Australia magazine recently reached out and asked what were some of the things to avoid when hiring, and published my thoughts online. There were some great responses, and here is the excerpt containing my mine. The CIO is planning to tap into data and analytics to help grow the organisation, and needs to add to the team to execute and complete projects. The CIO hands over a job description to a recruiter to source a data scientist or data analyst, an “IT resource needed for big data projects who has at least five years’ experience in working in this type of role and has a master’s degree in data analytics”. The recruiter has a ‘tick-off’ list but cannot find an ideal candidate who ticks all the boxes. Nine months down the track, the organisation still has not found a suitable candidate, with the CIO feeling like his or her only option may be to outsource the role. What could be wrong with this situation? I usually hire on potential rather than hard skills. Someone with at least five years’ experience in a nascent field is going to be hard to find anyway, so I would look for transferable skills such as problem solving or pattern analysis. What you’ll find is people who come from traditional BI sort of space, who have reinvented themselves. However, it’s a significantly different mindset to do big data type analysis versus doing traditional BI analysis. They are very different things, because they start from different points. One’s more exploratory and the other one is based on having a well understood set of parameters that you investigate. There are parallel fields that lend themselves well to this sort of skillset – people who have a masters or a PhD in mathematics or propositional logic and that sort of stuff. You can tap into that sort of skillset. It’s about how much time you want to invest in bringing them up to speed with commercial realities. What you really may want is someone with the core ability to attack a certain type of problem. Everything else you can polish around that. I also wouldn’t necessarily start by looking for someone to fill the role directly if I didn’t understand it deeply first. My approach would be to engage a specialised consulting service to deliver two outcomes: set up the data analytics practice or framework, and then assist me in recruiting the right person to fill the role. That way the consulting service, that I would ensure has expertise in data analytics, has assessed the maturity required to deal with the problem in my organisation, and can provide advice on what specific skills are required. They usually have a much better network of skilled professionals due to their focus or specialisation. If engaging a consulting service was not an option, I would reach out to my personal network to source the data analyst. If it was me, I wouldn’t write the job description for a data analyst by myself – I’ve been off the tools for so long so I wouldn’t know what to say technically. If you want to attract the right sort of people then you have to speak their language. 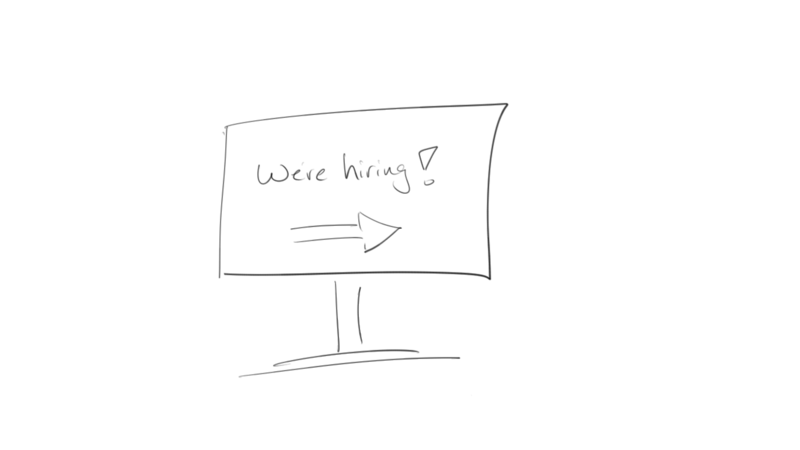 I don’t necessarily write job ads for developers or engineers, my teams helps re-write them because they understand what is current in the marketplace and what attracts the right sort of people. Do you contribute to recruitment in your organisation, and what sort of challenges do you face? Join the conversation in the comments here or on the CIO Australia website. As always, I continue to be amazed by my kids’ abilities to teach me lessons by forcing me to think about behaviours – theirs, mine, and people’s in general. This one came about during a recent camping trip. 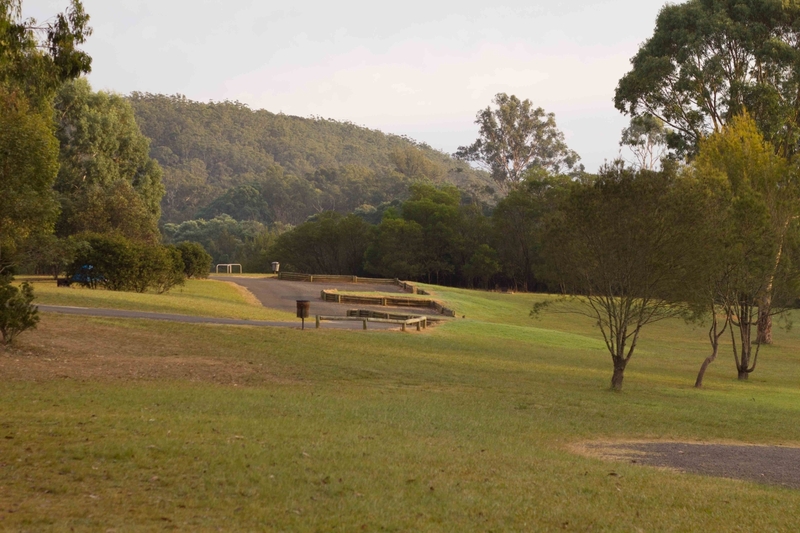 Hamzah and I camped overnight at the beautiful Bents Basin Campground, where we spent the day walking around trails and exploring the area. The next morning as I was preparing breakfast, Hamzah asked if he could have an Up&Go first. As I gave it to him, I asked him to sit down and pay extra special attention while he drank it. I told him that if he spilled it over himself we wouldn’t have a spare set of clothes for him to change into. Now I know that he’s only 5 (or 5 and a half as he likes to correct me) and doesn’t really have the ability to sit quietly and drink out of a straw from a milk pack while actually wanting to run around with his friends, but hey, I can try, right? As I finished cooking the eggs and toast, I went over to check how he was doing and found him sitting very quietly. When I squatted down, his eyes were full of tears and he said “send me to the naughty corner Baba”. At first I didn’t understand. But when he repeated that he should be sent for a time-out as punishment, I noticed that he had (almost predictably) spilt a little milk on himself. As I smiled, gave him a big hug and wiped the tears (and spilt milk) away, it struck me how important it was to him to try to do what he thought was the right thing. I hadn’t threatened him with punishment or even pressed the importance of not spilling the milk on him, merely made a passing comment as I had handed him the pack. Yet, he felt his mistake was bad enough to be disciplined, that he had let me down in a major way. This was interesting. What was the reason for him to not only recognise that he had done something wrong, but to also ask to be sent to the naughty corner? Was it the thought of having disappointed me? Was it the intrinsic recognition that he had made a mistake? I recently attended an AGSM Alumni event on Customer Centricity, hosted by Dr Linden Brown, author of ‘The Customer Culture Imperative’. Also on the panel were John Parkin – Director of Customer Enablement, Telstra, John Stanhope – Chairman (nonexecutive), Australia Post, Professor Adrian Payne – Professor of Marketing, Australian School of Business, UNSW, and Dr Judith MacCormick, Partner, CEO and Board Practice, Heidrick & Struggles. It was an excellent session, and is well worth listening to the audio recording as the panel discusses how to build strong, adaptable and innovative customer-centric cultures. One of the insights from the panel discussion was that customer centricity depends on highly engaged employees. Dr Brown related a story from one of his case studies about Zane’s Cycles, where the store had agreed to put a purchased and decorated bicycle in the store’s display as part of a customer’s Valentine’s Day gift. For some reason, the bicycle wasn’t put on display, resulting in a very upset customer. The rest of the story about how the business handled the situation is exemplary, and resulted in a happy outcome for both the business and the upset customer. However, one of the incredible parts of the story that stuck with me was the store employee who had been responsible for putting the bicycle in the store display recognised his mistake, and voluntarily wrote out a cheque for $400 to the store as compensation for the incident. To me this was an example of an employee who was so engaged that he volunteered to be (financially) disciplined. Here is the 3-and-a-bit minute video of Chris Zane – owner of Zane’s Cycles – talking about the event and how it unfolded. Well worth watching. I had a think about both these situations with Hamzah and the bicycle store employee, and how people get to the point where they are completely engaged. I can’t comment on the culture at Zane’s Cycles since I haven’t experiences it first-hard, but there are plenty of articles and videos on the internet discussing how they operate. I also recognise that Hamzah is only a child, and my child at that, so there is a certain amount of influence that filial piety plays in that situation. However, I’ve also observed this sort of engagement in my own teams, and here are some of the things that I believe can help create an environment that supports it. Everyone, including organisations, have values, whether they explicitly recognise them or not. The important step in creating engagement is to be clear about what these values are, and why they are important to you. In addition to this, you really need to live these values – to lead from the front, so to speak. When people believe in your values and see you living and breathing them, they will usually follow. This is about empowering people and giving them the latitude, respect and encouragement to try whatever path they want to take to get to the goal. Needless to say, this must be within reasonable boundaries and in congruence to the values discussed earlier. I’ve found that if you give people responsibility, trust in their abilities and provide a safe environment to fail, they intrinsically become committed to “going the extra mile”. Finally, remember that everyone makes mistakes. I make them all the time. If the mistake is genuine (i.e. not deliberate) and can be recovered from without too much effort, sometimes it’s better just to let it go. People remember this and give you emotional credit for it, and when the time comes around where extra effort is required, they will put it in without being prompted. Creating a culture that promotes strong engagement is a long-term and complex endeavour based on leadership and insights. What have you found that works for you? My friend Mr Arash Babayan from Microsoft managed to drop by the office today with a pre-production demo unit of the Surface Pro 3. There’s only 3 units in Australia at the moment with the official Australian launch not till August, so I was pretty excited to have a play and see what they’ve been up to at Redmond. Can’t really do an in-depth review after playing with it for a few minutes, but here are my initial impressions. The 3:2 aspect ratio removes that awkward long shape and finally makes this feel like something you would use as a notepad. More screen real estate and less squinting. I like. Coming from a 2kg+ Toshiba M200 and a 1.9kg Lenovo ThinkPad X200, the Surface Pro 2 weighs in at just over 900g, and feels light to me. I carry it all around and have no problems using it in meetings. 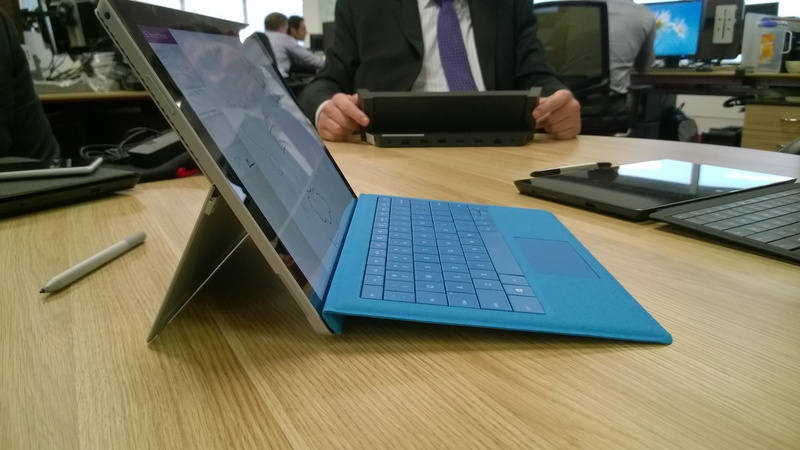 The Surface Pro 3 is even lighter (at 800g), and the weight is well distributed across the larger body. I was already a fan of the Type 2 keyboard, but the new, larger keyboard is all kinds of nice. Throw in the stabilizing magnetic strip and this thing is rock solid. It’s not going to fall off your lap on the train. Unless you’re falling. Then it will fall off. With you. I don’t mind the kickstand on the Surface Pro 2, but the new, up-to-150 degrees full-friction kickstand on the Surface Pro 3 is just magic. On your lap? No problem. Lying in bed? No problem. Sitting in awkward angles just to prove it works? No problem. It’s good. Let’s face it – the trackpad on the Type 2 keyboard took a step backwards and was … well … terrible. I occasionally use it when I don’t have a proper mouse or touching the screen isn’t right, but it causes lots of frustration. The new trackpad fixes all that. It’s smooth and silky and just … good. I’ve been a Wacom fan for over a decade. Their active digitizer technology was always noticeably better than N-Trig’s, and somehow I just didn’t like the laggy inking experience with the battery-based pen. This was probably one of the biggest reasons I stayed away from the Dell Venue 10 Pro. 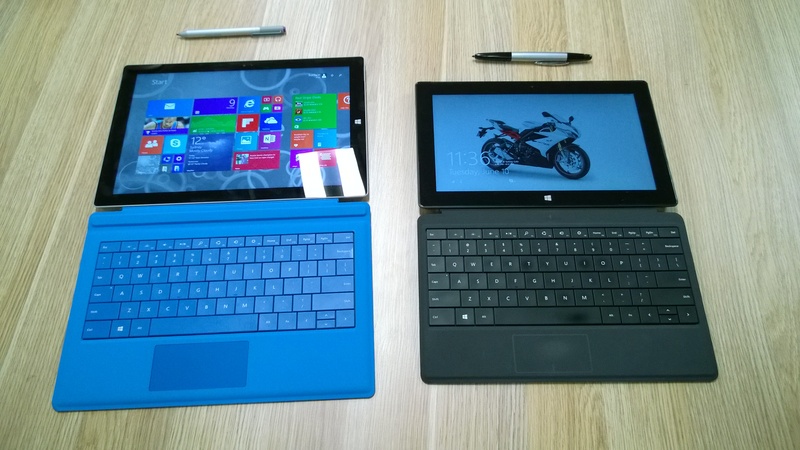 The new generation N-Trig digitizer on the Surface Pro 3 … now this is something different. A paper-like inking experience with almost no lag and just enough drag to make it feel like you’re writing on paper with a pen. The thinner screen makes the parallax almost negligible. Consider me converted. You had me at “click”. I mean, it looked awesome in the video, but I had some reservations. I mean what about security? If all it takes to get in is clicking the pen, that might be a problem. 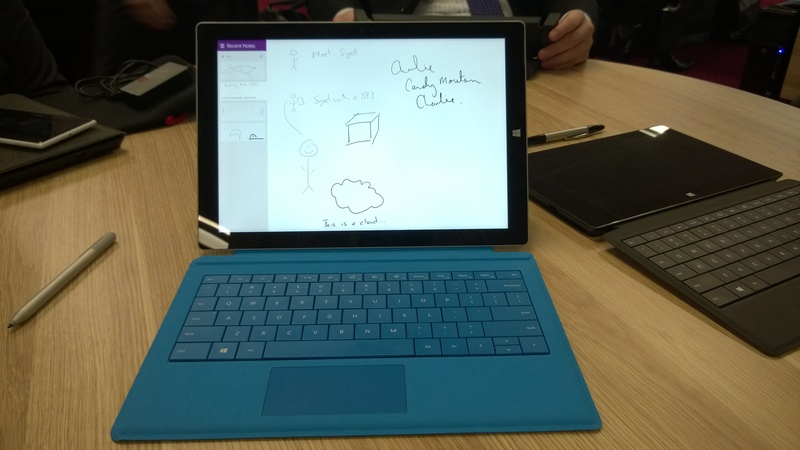 But no, clicking the pen wakes up the Surface and loads a locked OneNote page which you can write on. To unlock the computer, you still have to login. Sold. It’s plastic, magnetic and slides into the power slot. No more scratches to your shiny black Surface Pro while you try to connect power. The power supplies, pens and protective sleeves no longer fit. This means I’ll have to buy new stuff. Oh well. Yeah, it has the pin and the picture password, but nothing makes you feel warm, fuzzy and secure as swiping a finger over the biometric reader to log into your tablet. I’ve been using tablet devices for ten years waiting for the hardware to catch up. We’re almost there, but I’ll take the Surface Pro 3 any day.